These days, we see drug diversion incidents appear in the news at an increasing rate. 28,000+ patients were potentially exposed to Hepatitis C Virus (HCV) through drug diversion. All of this was due to the carelessness of HCV-infected health care providers. While its tempting to dismiss as a rare happening, this high exposure rate can happen anytime without proper precautions. For example, one surgical technician caused 18 cases of HCV infection with more than 8000 total patients impacted across three facilities. This single event resulted in a 30-year prison sentence for the diverter. Although these numbers are staggering, it is easy to lose sight of the fact that these numbers represent real people. These people’s lives were devastated because a healthcare provider tampered with needles, syringes or medication vials to get ‘high’. These people could have been your child, your spouse, your mother. If you access healthcare, it could happen to you. The irony is that these people acessed healthcare seeking better health, but in the process, were exposed to a deadlly disease. And the situation is completely preventable with procedures and policies in place that are designed to prevent drug diversion. 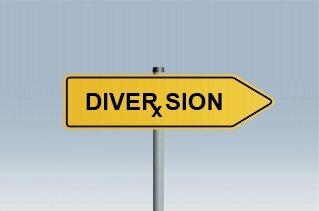 Drug diversions can spread more than HCV. Other infections diseases associated with drug diversion include: pseudomonas pickettii, serratia marcescens, achromobacter xylosoxidans, ochrobactrum anthropi, stenotrophomonas maltophilia, and klebsiella oxytoca. It’s imperative to educate yourself on these diseases and how they can spread from drug diversion. Patient safety is of the utmost importance, so arm yourself with knowledge of how to prevent, address, and handle drug diversions. Ensure all of your syringes and saline solution are not compromised or tampered with. Check out the infographic below from Diversion Central by Omnicell for more information.